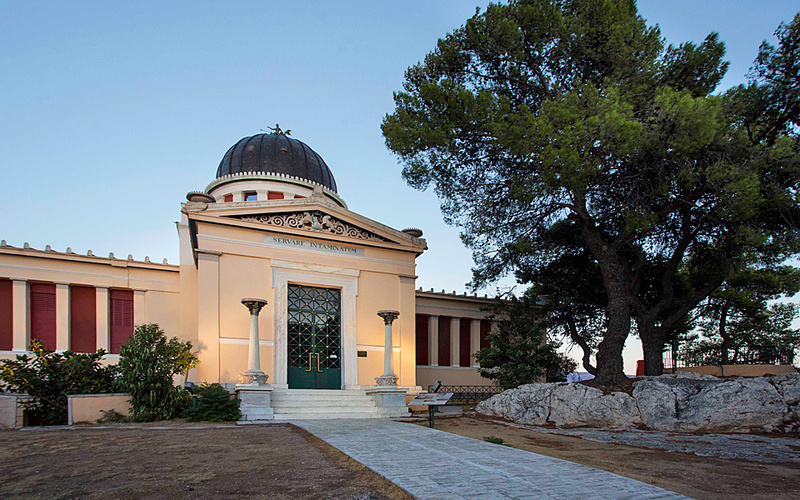 The National Observatory of Athens in Thiseio where visitors can gaze at the stars. 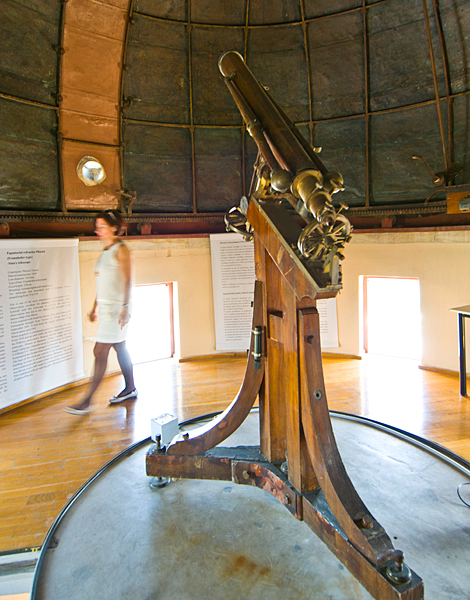 Tucked away in the very heart of central Athens, the city's Observatory is a secret hiding in plain site. Few memories are sweeter than those nights gazing at the stars from the safety of a parent’s embrace, somewhere between heaven and Earth. Every new experience with astronomy reawakens that child that thirsts to discover the world and its limits. The NOA is one of Athens’s best-kept secrets, but not for long as it’s being discovered by more and more people thanks to a program of tours for schools and independent groups launched in recent years as part of the institution’s efforts to reach out to the public. At the iron entrance gate we are welcomed by the NOA staff, including astrophysicist Dimitris Tsimbidas, an amiable man in his 30s who, together with a group of other young scientists, is responsible for showing people around the observatory and explaining the function of the different buildings and instruments. He tells us the story of the NOA. Not surprisingly it was founded as part of the process of building a modern Greek state following the country’s liberation from Turkish rule, and the desire of the nation’s benefactors to endow the Greek capital with all the institutions to be found in other European cities. 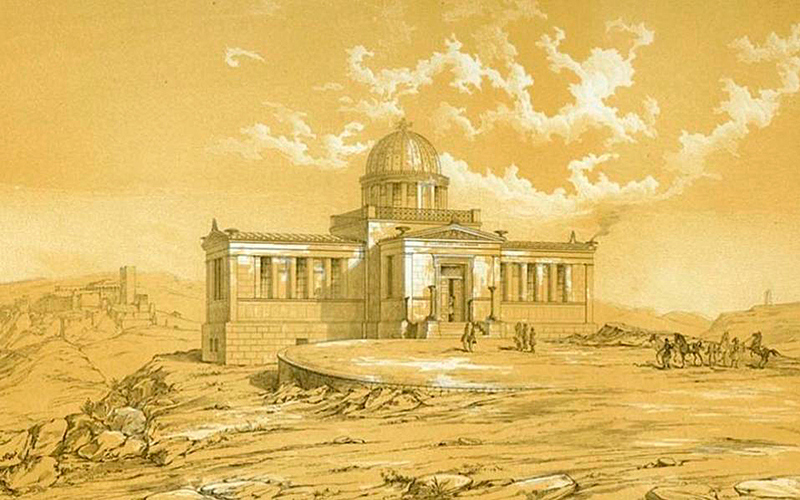 The Observatory was inaugurated in 1846. 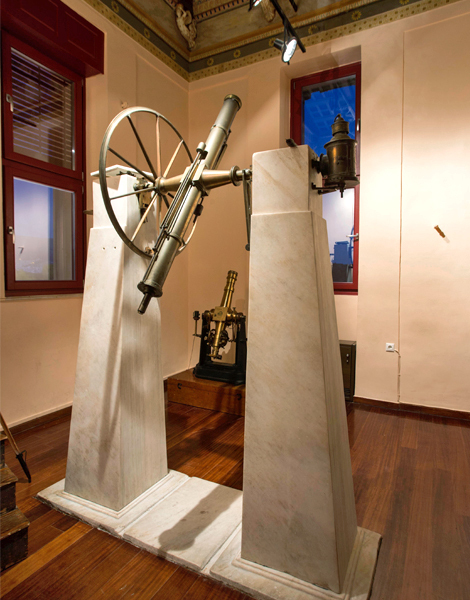 “The initial aim of the institution was to measure time and record meteorological phenomena,” explains Tsimbidas, adding that the observatory’s current president, astrophysics professor Kanaris Tsinganos, believes that Sinas and Vouris had the foresight to see that shipping would be one of the main pillars of development for the newly established Greek state. Before I enter the building I take a few moments to enjoy the view from the courtyard, from where all distances are calculated between Athens and other parts of the country and the world. Crossing the threshold of Sinas’s historic building, the significance of such institutions and edifices in the forging of the Greek state’s identity becomes instantly apparent. Imposing and sparsely elegant, they set the aesthetic standards through neoclassicism. The building has been beautifully restored by the School of Fine Arts. Pieces from the Observatory's history, such as this telescope, are on display for the public. 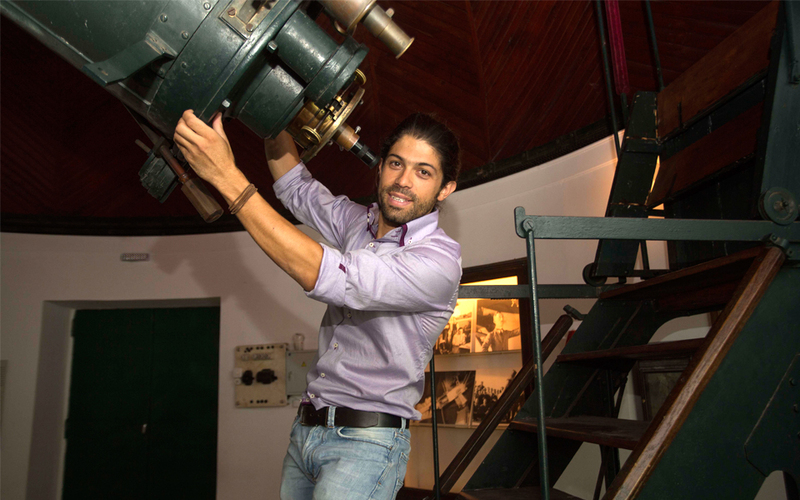 Visitors can learn about the history of the Observatory and the projects it is involved in. 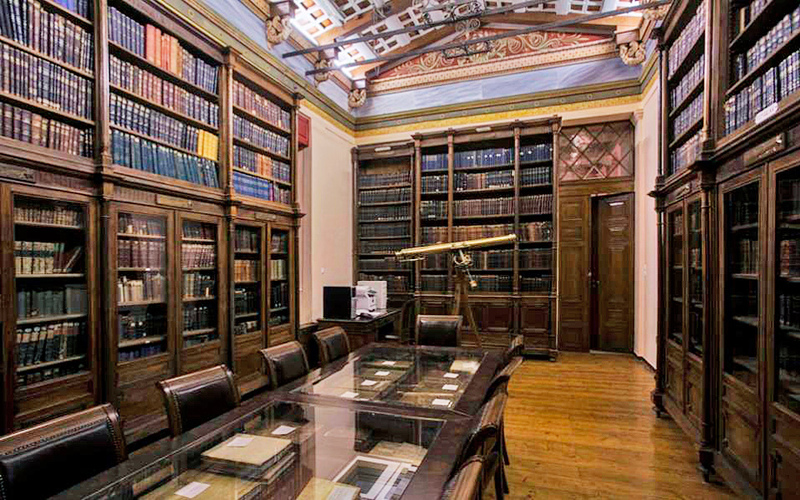 The halls of the building designed by Hansen have displays of instruments as well as a library with an enviable collection. One of the highlights is a map of the moon that was the most accurate ever drawn in its time, created by Julius Schmidt, a German and the NOA’s third director (1858-84), who was also responsible for enriching the library and the observatory’s technical capabilities. His monumental topographical survey of the moon was possible because of the clearness of the Athens sky. The map is 2 meters across and consists of 25 sections that represent the entire part of the moon that is visible from Earth. It was drawn with the help of a refracting telescope designed by Simon Ploessl and has over 32,000 details. A copy of the original map is on display in the observatory’s museum, while the telescope through which Schmidt observed the moon is just a floor above, though it is not in operation. The NOA started organizing visits in 2008, but one of its highlights, the Dorides telescope made by Gautier had been out of operation since the 1980s after suffering mechanical failure, and the other telescope at the dome was also out of order. In 2014, the then head of the OTE telecom group, Michalis Tsamaz, happened to take a tour of the facilities and decided to help after seeing the problems. He dispatched a specialized technical team from OTE to conduct a study and fix the electrical and mechanical faults. At the same time, the facility was given a full maintenance makeover and the footpath leading up to it was properly illuminated to make access easier for visitors. The head of the team, Giorgos Kladouchas, says that the work took two months to complete. The library of the Sina building. Tsimpidas opens the dome with the push of a button, revealing a slice of the evening sky. With skilled movements, he moves the hand-operated telescope to point to the moon. You need to climb some steps to reach the eyepiece. The view of a part of the moon is crystal-clear. This is the wonderful epilogue to a fascinating visit to one Athens’s greatest gems, connecting us to the universe. Details on the NOA and its program of tours, which must be booked in advance and are available in multiple languages, including English, are available on its website.